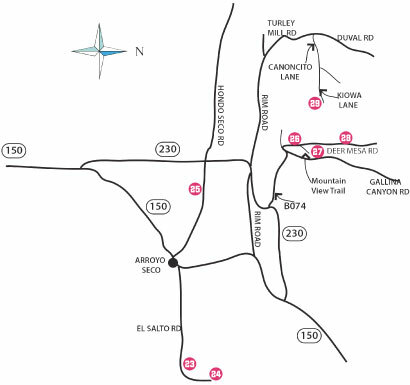 Take Paseo del Pueblo Norte through Taos to the intersection of Hwys 64/150/522. Turn right on Hwy 150 towards the Ski Valley. Pass the Quail Ridge and turn left on NM 230. Follow to the Rim Road. Take a right and continue following NM 230 down the hill into the Valdez Valley to CR B-074. Turn left onto B-074. Follow for about a mile to the split in the road. Deer Mesa Road goes to the left and Gallina Canyon Road goes to the right. Turn left on Deer Mesa Road and follow the main road around to the right. There will be signs for the Open Studio Tour for Tour Stops #26, 27 & 28. Open only for the tour, Saturday, Sunday & Monday, September 1, 2 & 3 from 10-5. For other appointments, please speak to the artists directly during the tour.